Thom has taken over Gattina’s meme invention, Muffed Target Photo Meme. The idea is to share our photos that didn’t turn out. Come on, you know we all have them! You share yours and I’ll share mine! I have a new macro lens. I have yet to figure out how to use it. I took this photo in broad daylight. 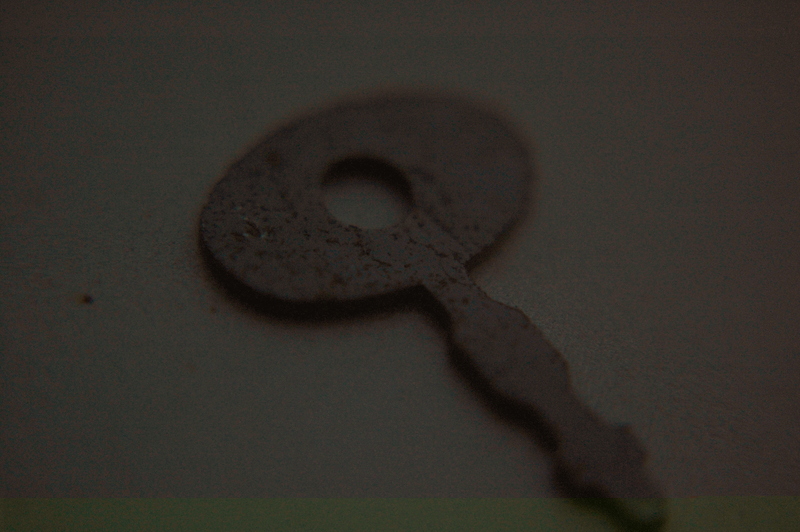 That is a rust covered silver diary key. I found it on the ground and placed it on the hood of my gold car for this shot. Why is it so dark? Why is there no color? Why is there no focus? Yes, my light meter and f-stop were set for the conditions at hand — unless the lens itself changes those factors. If so, how? What does the EXIF data say? Did you maybe have your ISO on the wrong setting? Nicole – -it pretty much has to be ISO, doesn’t it? But the settings were right for the light before I put the lens on. Most likely a mix of ISO, Apt / exposure mix. I had one like that yesterday and it was ISO / exposure screw up. Nicole — the band at the bottom of the pic is from the upload. It isn’t on the original. Bwahahaha that’s something I could do without the aid of a lens. Of course this couldn’t be operator error. Thanks for playing Q. Much appreciated. Thom — I am reasonably certain it is because the operator doesn’t know how to work the damn thing and it didn’t come with a manual! You don’t really need a manual for a lens, do you? Nicole — it is just a 52mm 10x lens. It said it was made to fit my 55-200mm lens. Very strange. If I couldn’t see the silhouette of the silver key, it almost looks like you had forgotten to take of the camera lens cover. Great Muffed Target. Have a wonderful week. Rosidah — my cover is solid black. Plus, my camera won’t take a pic when the lens cap is on. If you can’t see the tiny silver key you might want to adjust your monitor. i’m no help to you here. Tilden — it does look as though the lens was fogged, but it wasn’t. I wish I had your problem. Mine’s a point and shoot variety. Roan — I love my camera but there is always something new to learn. I cannot answer your questions, but it does make an interesting shot! Karen — interesting yes, but not my vision! Amanda – -why does that not surprise me? You are a gem. Obviously a case of DLP (demonic lens possession — happens to me *all* the time) — but the photo’s pretty cool in spite of the weird color thing going on. Susan — I knew that was it! And I didn’t see any evidence of a diary. Just the key! If there’s one thing I know Quilly, it is this… YOU will get it figured out! In the meantime… it made a great muffed shot! Melli — I may get it figured out. I have put the dang thing in my purse and it could be weeks before it surfaces again …. basically, it’s a cool shot. it could use a bit more light, though, and that bottom line puzzles me. my first guess was ISO too, but then i thought, does the lens have a manual/auto switch? was it set correctly? is the lens fully compatible with the camera, ie can it connect to the camera and read its settings? Polona — as I told Nicole, the line came from the upload and isn’t on the original photo. I purchased this lens because it is supposedly an attachment for my 55-200mm lens. When I put it on my 55-200mm lens and try to auto focus, the camera freaks! Lots of buzzing and attempts to adjust and no focus. Next I set the picture up without the lens, put the lens back on the camera and used manual focus. This is what I got. I have no idea as to the answers to your questions, but boy, is that a cool photo for an eerie story…I’m waiting . . .